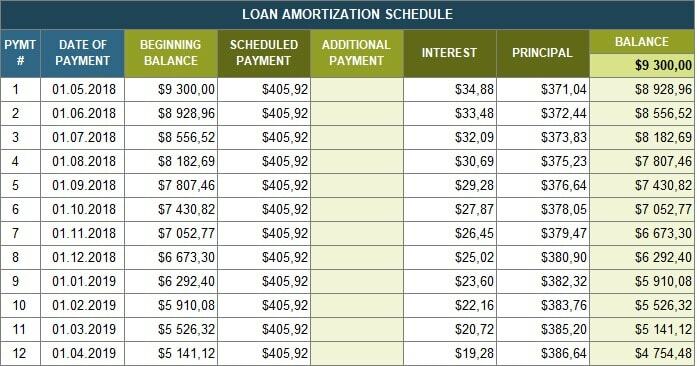 An amortization schedule is a table with payments where a customer can see how much interest and an amount of debt are included in a regular payment. Although a monthly payment is the same every month, initially it covers interest and includes a very little amount to cover an amount of debt. It starts covering an amount of debt only in a few months. The last row of a table shows how much interest a borrower will have paid by the end of a loan term. Also, this table shows all additional commission that a borrower should pay. A customer can use a calculator to estimate the cost of a loan. Thus, a customer can analyze payments, interest and other possible terms before taking a loan. It is a good way to define how much interest you will pay if you are going to pay back it ahead of schedule. If you want to pay less interest, you have to make extra payments. All extra payments go to cover an amount of debt. The interest is calculated on the balance of the debt. So, the smaller the balance, the less interest you will have to pay. Auto loans. Usually, it is a five-year loan. But it is possible to take a longer-term loan. Although it will be really expensive for a borrower because you will pay only interest for a few years. This type of loan includes extra commissions such as insurance. Home loans. It is a type of long-term loan. A mortgage has a fixed rate. As statistic shows most people pay back these loans ahead of schedule. Personal loans usually are given for two or three years. These loans also have a fixed rate, fixed payments, and term. Credit cards don’t belong to amortizing loans. You can have a term of a credit limit. You can have a fixed rate. But it is impossible to have a fixed payment because every month you can use credit money or money that was paid to cover debt previously that influences on a monthly payment.